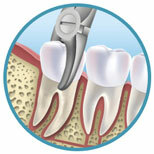 We can provide all kinds of oral surgical procedures, from tooth extraction to implant placement. Sometimes it is necessary with the help of surgical intervention to remove the pathological process over the affected root or intervene in diseased gingiva. This kind of intervention and complicated tooth extraction is done painlessly under local anesthesia. In the event that there is an adequate size bone for implant placement, by raising the sinus floor and placing a deputy to the bone, we can create the necessary conditions. Dr Nadica Vučić i njen stručni tim s radošću Vas očekuje, stoji Vam na raspolaganju za vrhunsku uslugu i stručni savet iz svih područija estetske i opšte stomatologije.